I have been absolutely overwhelmed by the amount of support the #GoodForThe19thWard campaign has received in its beginning days. The announcement on Facebook has reached more than 4,600 people, while the blog post has been read by hundreds. People have been sharing their thoughts and images on Twitter and Instagram. Honestly, this makes me want to pump my fist in celebration. I’m proud to live in a place where so many people care about the future of their community and want to lift their voices to say that the status quo is not enough. So what do people actually want? While Beverly, Morgan Park and Mount Greenwood don’t have the concentration of residents and commuters that some of the areas where Divvy has been successful, that doesn’t mean it can’t work here. I would even go as far as saying that our network of streets and trails coupled with the existing transit options available to residents makes us particularly well positioned for bike sharing. For the most part, our historic street grid means disparate parts of our neighborhoods are well connected, but there are few options beyond driving for getting around in a pinch. Buses are infrequent, and they don’t connect major activity centers like the mixed-use districts around our Metra stations. Walking is always an option, but while these hubs of activity are physically close, there is generally not enough stimuli between them to compel people to hoof it from one to another. To top it off, the Metra Rock Island Line, in its current state, is useless as a mode of rapid transit that could take people easily between, say, 95th Street and 111th Street. 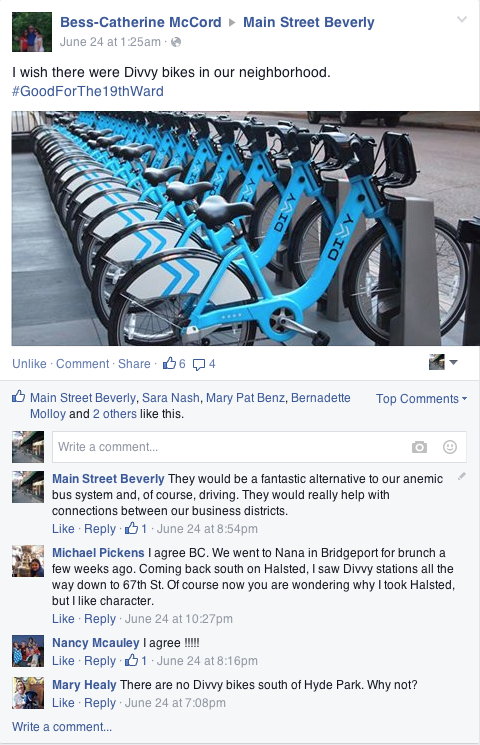 Strategically placed Divvy stations have the potential to fill significant gaps in our neighborhood’s transit network. The service would offer an affordable ($75 for a yearly membership) alternative to automobile transportation that would be useful for short trips, connections between home and Metra and general recreation. Plus, I would hope that having it in our community would inspire our leaders to take action — or at the very least have a serious conversation — about making our major corridors safer for transportation modes other than cars. 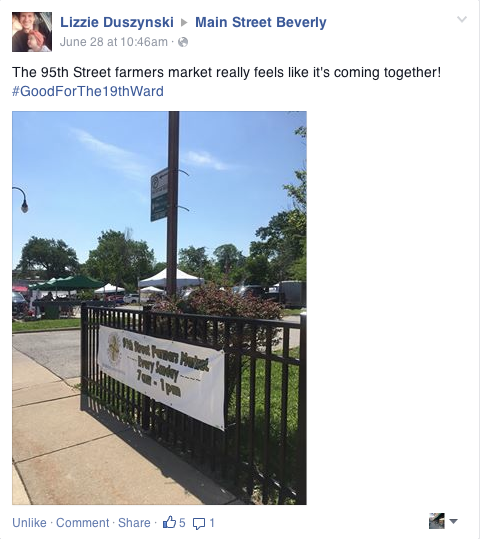 The 95th Street farmers market also got a shout-out. More than anything else happening on 95th Street, whether it be streetscaping or new businesses, the market has the most potential to bring about change — or at least change people’s perceptions about the function of 95th. For half the year, people are all but guaranteed to visit 95th Street, and I would venture to guess that many of these people have no reason to visit at any other time. In other words, the market makes the street function like a street, a platform that supports spontaneous social and economic interactions. As much as I love the market — my wife and I are regular shoppers — I actually think it has the potential to be better. Currently, the market is confined to a single parking lot: The vendors are fenced into the same space where people park their cars, meaning there is little spillover to the surrounding area. This is not a good thing. 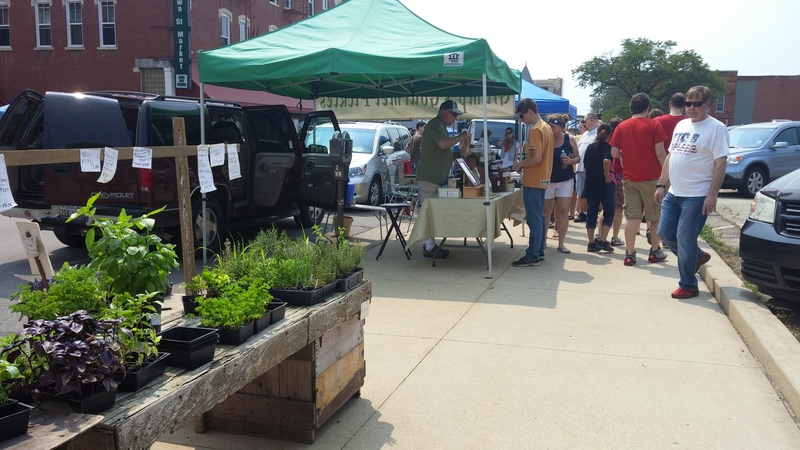 Essentially, the set-up of the farmers market reinforces the prevailing notion that everything that occurs on 95th Street must be self-contained. However, on a properly functioning street, everything mixes. Now, let’s contrast this with a different take on a farmers market. Over the weekend, I visited the market in Dubuque, Iowa, and I decided to take some photos to help illustrate how it contrasts with ours. 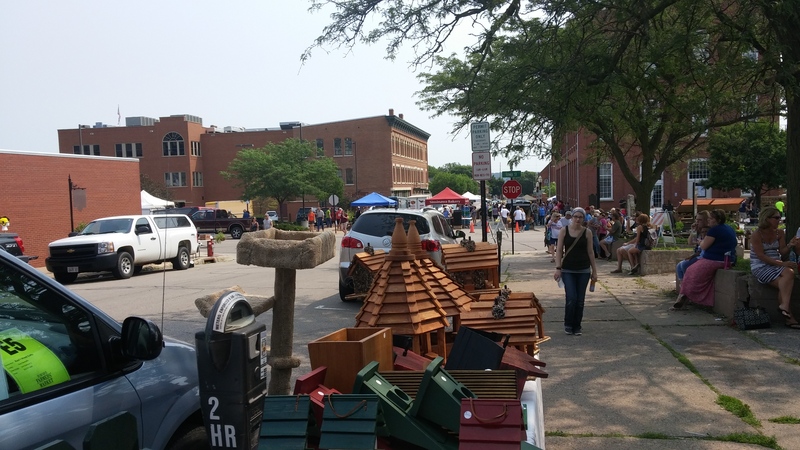 The Dubuque market literally takes over several blocks in the heart of downtown. Vendors set up along the sidewalks rather than in the parking lots. In some cases, streets are closed, but many remain open, allowing all forms of traffic to circulate amid the activity. It might look chaotic, but it’s the highly organized form of “chaos,” the same kind of intricacy you see in ecosystems of all sorts. No cars, but lots and lots of people — and this is 10 minutes before closing time! 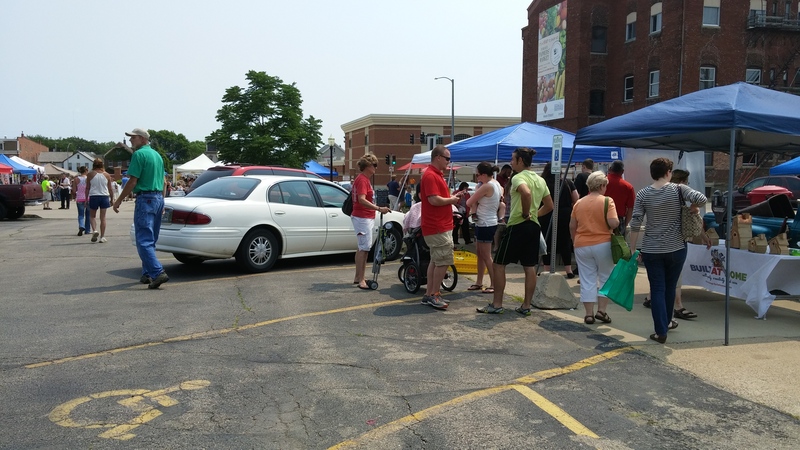 People visiting the farmers market can wander in and out of other businesses downtown. The bar located in the building in the background even opened its doors before noon. Vendors line the streets; they aren’t confined to the parking lots. Even where parking lots exist, the vendors still stay along the sidewalk, enabling foot traffic. This was one of the streets closed to vehicular traffic, although many of the intersecting streets were still open. 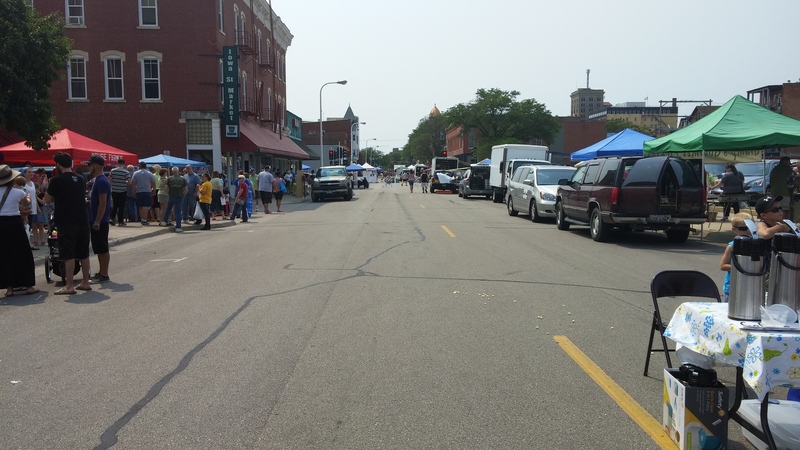 Although the Dubuque market is significantly larger than the 95th Street market, we can imitate its layout to help encourage activity along 95th. Well, some people ventured into the middle of the street. This was one of the streets still open to vehicular traffic. The vendors along here still got plenty of foot traffic, especially from the people who parallel parked nearby. 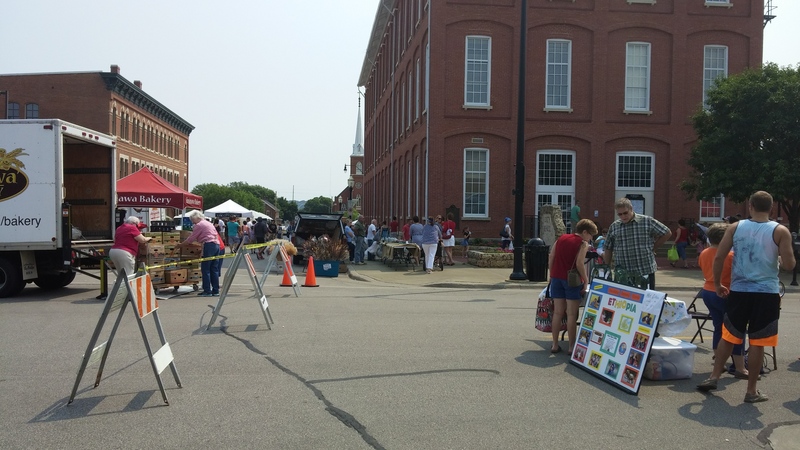 The market enlivens downtown Dubuque. To use a slightly jargony term, it “activates” the streets. Neighborhood businesses that choose to open benefit from the critical mass of pedestrians that both live in the area and descend on it from other places. 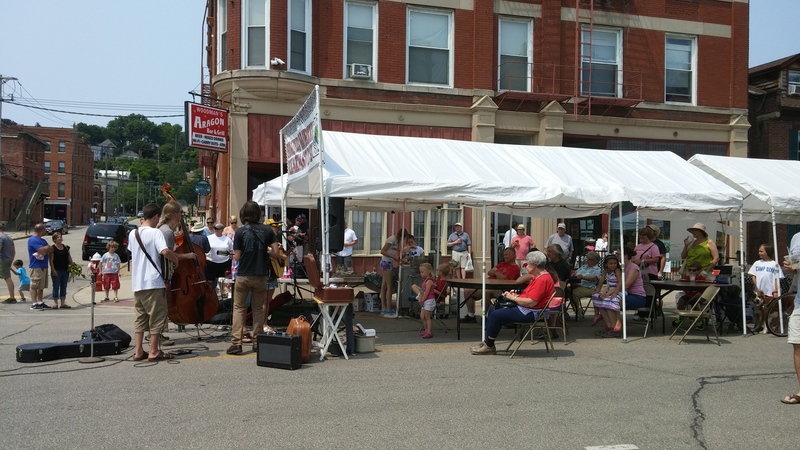 Like the 95th Street market, it is located in a part of town that is underutilized — the Dubuque’s downtown revitalization seems to be working from the south to the north, and the market is in the later — but it provides a real-time, real-world example of what a vital neighborhood looks and feels like. The 95th Street market, on the other hand, does not enliven the street. All of the bustle is corralled. 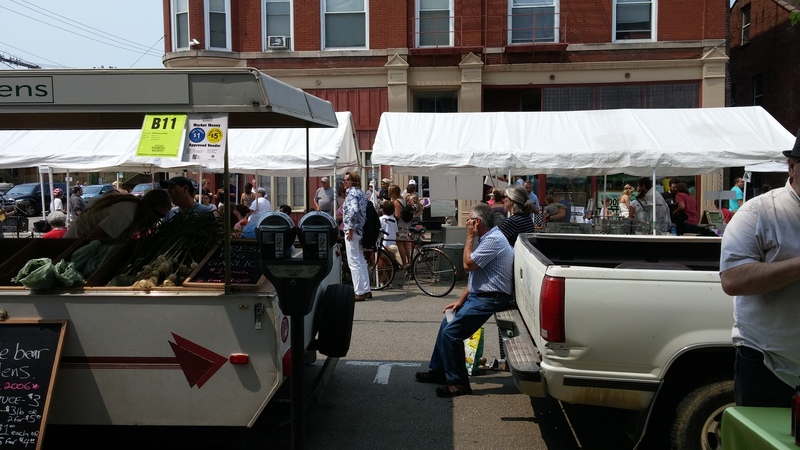 If we brought the 95th Street market out of the parking lot and onto the street, it could have the same impact as the Dubuque market. 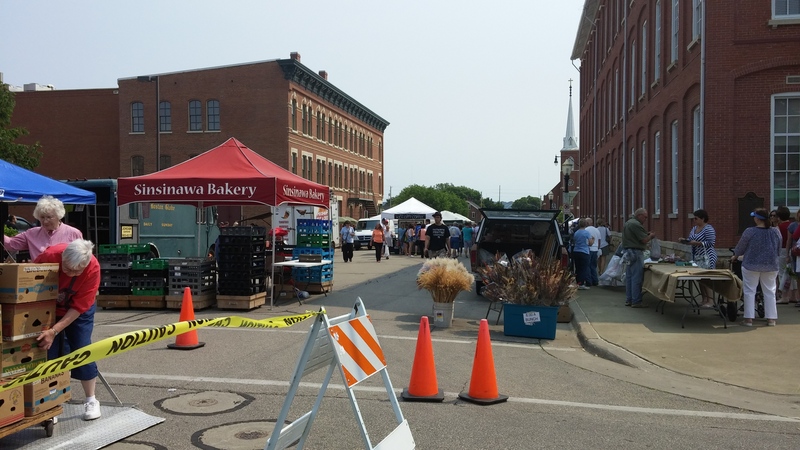 OK, so the Dubuque market is many times larger than the 95th Street market, but we can still work under the same philosophy. In fact, this is how markets in other Chicago neighborhoods work. 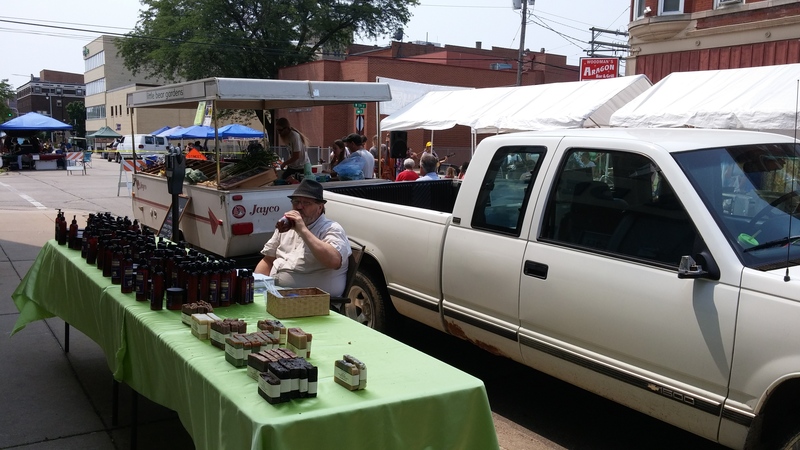 The Andersonville farmers market, for instance, is set up along a single block of Berwyn Avenue between Clark Street and Ashland Avenue. Our farmers market could easily be set up in the space created by one of our residential street blockades and then spill out onto the sidewalk along 95th. People who dive to the market would have to walk along 95th to access it, creating more synergy with the surrounding areas. Such a simple move could help change the relationship pedestrians have with 95th Street. Please, everyone, continue to post photos to Facebook, Instagram and Twitter and tag them #GoodForThe19thWard. This campaign has helped raise the voice of the people, and it sends a clear message about how we want our neighborhood to develop. Thank you to everyone who has gotten on board, and I can’t wait to see what else the residents of our community come up with.